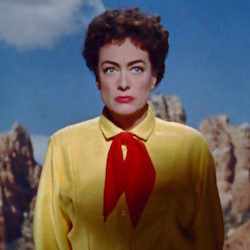 In this episode, we are joined by special guest Pat Wick and we watch the bizarre noir-western, Johnny Guitar! We highly recommend you watch the film before listening to the episode, because, really, it must be seen to be believed. This film is currently available for streaming rental on iTunes, Amazon Video, Google Play, and Microsoft, and also has an excellent Blu-Ray release. Join us on December 21st for our episode on The Big Heat! Plot: After helping a wounded gang member, a strong-willed female saloon owner is wrongly suspected of murder and bank robbery by a lynch mob.